My name is Marc Hoffman. I'm a nature photographer and web developer living near Seattle, Washington in the U.S. I created Songbird­Photo.com as a way to share my photos with others. I started taking nature photos in the 1990's, using a digital point-and-shoot camera. In 2007, I bought my first digital SLR (a Canon 30D) and a 100-400mm professional lens. Those tools created the potential to take great photos, and helped me see more clearly what I was doing right and wrong. My current camera is a Canon 5D Mark III. The Pacific Northwest U.S. has been my home for over 25 years. Its habitats include mountains, wetlands, prairies, woodlands, rainforests, and open waters—a nature photographer's paradise. 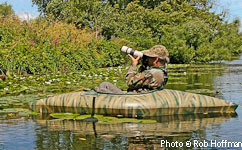 I do most of my shooting here, either on foot or in my kayak (see photo at right). 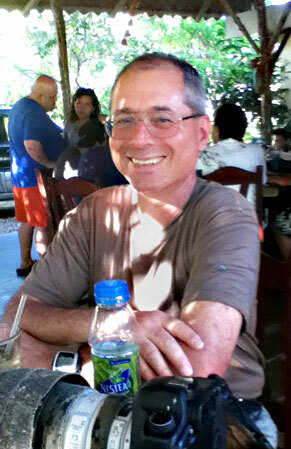 I first visited Costa Rica in 2001 with my wife Tina and son Cory. The place intoxicated me. Vast jungles and extraordinary wildlife awakened fantasies I'd had since watching Tarzan movies in my childhood. We revisited Costa Rica in 2005, and since 2009 I've traveled there annually, dividing my time between photography and community service. Between visits, I've been working on becoming fluent in Spanish. The Camera: Barrier or Portal? Some say the camera distances the observer from the observed. For me, photography helps focus my attention. So, while I strive to improve my technical skills, taking a photograph remains a deeply intuitive act in which I feel the barriers dissolve between myself and nature. I hope my photos strengthen your connection to nature as well. I encourage you to share your thoughts. 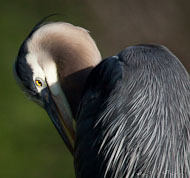 The Great Blue Heron, though quite common where I live, is one of my favorite subjects. I'll spend hours watching an individual. Absolutely still, it waits for a fish to swim by, then spears it with startling speed and accuracy. This one preened as I sat in my kayak 10 feet away. Watch a bird's body language to know if you're getting too close. Preening is a good sign that it feels safe. 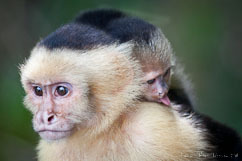 Why Travel To Costa Rica—Reason #139: Outside of a visit to the zoo, you'll never get this close to a White-faced Capuchin and her baby. Taken at Manuel Antonio Park, Costa Rica. This photo is one of many you can purchase as a notecard. I take a lot of photos from this little kayak—a Micro Poke Boat. At 8 feet long, 34 inches wide, and weighing only 18 pounds, it's extremely portable, stable, and durable. My brother Rob Hoffman took this photo while visiting from California. Here's a map of North and Central America pointing	out Seattle	and Costa Rica. Satellite photo by NASA.